This is something a bit off-script. The chair of the City of Pittsburgh Planning Commission has some issues with the proposed headquarters for U.S. Steel, the first major development in the works for the rebuilding of the Lower Hill District. Trib: Pittsburgh Planning official pans U.S. Steel headquarters proposal. PG: Pittsburgh Official Does not Like proposed design of new U.S. Steel headquarters. It is not like U.S. Steel and local government have never been at odds with one another. It was more Big Steel's anger at some new Allegheny County (Pittsburgh, Allegheny County... whatevs) regulations over some pesky new air regulations that prompted the corporation to run these full page advertisements in 1976. Different context, but the sentiment may be in play again. If that comes to pass, the doomsaying over development in the Lower Hill has also been in play for some time. Recall that everyone thought the plan for a Penguins-linked casino was thought to be a sure thing once before being pre-empted, surprisingly, by the late Don Barden. Why was that? In part because it was linked to development of the Lower Hill and keeping the Penguins in town. When it didn't come to pass, there resulted lots of gnashing over whether the Penguins themselves would leave the city. Yes, that unthinkable was on everyone's mind, see Washington Post: Penguins' Future in Pittsburgh in Doubt. But if the will is there, there is always a Plan B. Development Plan for the Lower Hill District. I will leave it to the land use planners and architects to debate the finer points of what the plan intended vice what USS wants to build. What I wonder about more is that if the finances do not allow for something more grand, for lack of an adjective, for this one parcel, how is it that the plan for a not-cheap multi-level park/bridge will be feasible not far away. That is a big part of the plan right? See last fall: @brotheroneill: Building Park over I-579 could cap rebirth of the Hill. That has actually been part of the 'plan,' as far back as the Isle of Capri's vision for the Lower Hill District (see Pittsburgh City Paper 12/2/20016: For Hill Residents, Requests from Casino Developers May Be Too Much, Too Late ) Goes back to the difference between things proposed vice things that actually happen around here. Why am I thinking of the promised Intermodal Grant Street Transportation Center? ("It's as close to an intermodal transportation center as we'll get,") But save that for later. The basic answer to your question is that the hope would be that a lot of federal money would help pay for the deck-park. But there is also a problem with the premise. What quality and scale of project would be possible if this parcel (owned by the public, incidentally) was actually put out for bid in a fair and open process? 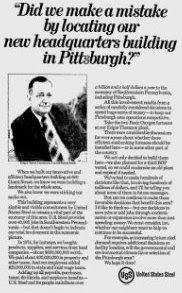 We'll never know, because the development rights were just given to the Penguins as part of their bribe to stay in Pittsburgh, and in turn they just signed up US Steel for this project (during a time when they were having political issues, I might note). So is this actually the highest and best possible use of the land at this time? It would be an amazing coincidence if so, because nothing about the process has been designed to ensure that result. Uncle Martin asks why can't we build a 22-story residence for elders like they're doing in Manhattan? (that's 22 ten-person households -- alternatives to institutional skilled nursing beds of which we have an over-supply in the region). The Hill CDC (and I'd wager everybody in some way connected to it) legally signed away its right to object to the US Steel portion of the plans so long as it aligns with the new zoning, and whatever else went into that agreement. If Hill residents can't objecting in an organized manner, I don't love the chances of anything of US Steel's being changed very much. Of course if you're saying the new building doesn't comport with the old PLDP, that maybe that shakes things up, but I feel like I'd have to gear up for a scavenger hunt to figure that out. Regardless of that the Hill CDC might have agreed to, they are not the only stakeholders in the Lower Hill's development. And the City can and should reject the proposed amendment to the PLDP, and therefore the FLDP in its current form. Unfortunately, however, if the Penguins and US Steel both want something, then the general public probably doesn't stand much chance with our local politicians and appointed officials. By the way, it is pretty ironic that the cover page to that proposed amendment still has an older rendering which shows this block contributing to a nice, walkable, urban neighborhood, when in fact the actual amendment is designed to allow this block to look nothing like that rendering. I think that sort of sloppy self-refutation shows how much they are certain that this is all just a formality with the powers that be.